Designing and installing landscapes for more than 30 years. Landscaping is more than installing some trees and shrubs. At Molzon’s we develop outdoor living space. Molzon’s can create and implement a comprehensive plan for your property or develop a small area on the site. Our college educated and professionally trained designers will use their expertise to create an oasis in your yard for your pleasure. Molzon’s crew will take from concept to completion of planting a beautiful foundation planting or privacy screening. 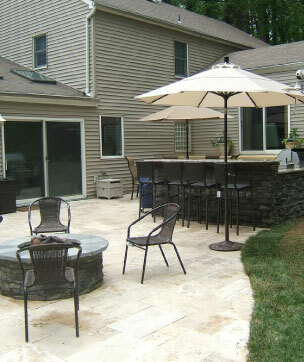 Our talented hardscape crew will build an outdoor fireplace or outdoor kitchen for your enjoyment. Function and feasibility always work. If the project is functional, it will also be aesthetically pleasing as well. 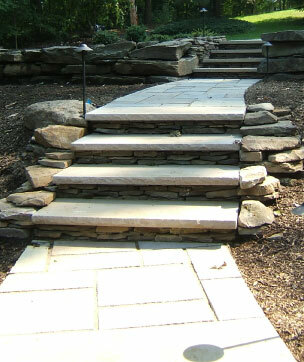 Pavers create the perfect walkway or patio to maximize your usable outdoor space. Our stone masons can develop exquisite stone walls for retaining or a free standing barrier. Our aim is to not only meet your expectations but to exceed them. If you want to review your landscaping issues – its easy, call the office to arrange a consultation. A Molzon representative will visit with you on site to go over your options. The more information you have the better we can help. A scaled survey of the property. Any pictures of specific areas to be discussed. Information on other improvements such as pools, additions, sheds, etc. A list of any or all problem areas. Plant the right tree in the right spot. Space the tree or shrub at the appropriate distance from the buildings, walkways, patio and each other. Ultimately fill the beds with vegetation. After all, they are planting beds and not mulch beds. We are able to produce concept landscape plans to properly plan your outdoor environment. You can view examples of our plans in our portfolio. For a consultation, please contact our Landscape Design Division at 732-741-9098 or jerry@molzons.com.